24 Best Cheap Drones  Read Now Or Regret Later ! The public has developed a big demand for Unmanned Arial Vehicles, consequently drone industry began booming in the last few years. The potential of drones is endless, a new era of technology is starting and drones are its core. They can be used to record and photograph, to deliver products, to race, companies are finding new approaches and utilities they can give to drones. Today we’re here for the best affordable drones. The number 1 cheap drone with camera title goes to the all-new drone by MJX – the Bugs 2. If we are to be more precise here, we are focusing on Bugs 2W, the superior version which boasts with WiFi FPV and excellent flight characteristics. So, without much further adue, let’s see what’s this baby all about! Starting off with its specifications, it is safe to say MJX Bugs 2W does not fail to deliver. 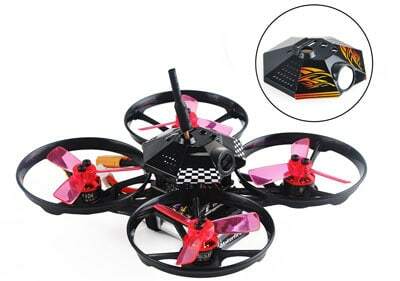 Besides a hefty 2S 1800mAh battery, this birdie also sports 1800Kv brushless motors and full HD built-in camera. However, you will not be able to make a 3S battery upgrade as that would most likely result in destroying the ESCs. But, what you can do is have a ton of fun with the provided battery as it can still hold on for up to 18 minutes, which is slightly more than Bugs 3. The operating range, on the other hand, goes much further than B3. More precisely, MJX Bugs 2W can reach more than 500 meters away from its controller, but it is damn near impossible to see it at this distance… especially considering the FPV range goes only to 200 meters. Yes, this birdie has FPV as well. Unfortunately, we are not talking about 5.8G but WiFi FPV, so don’t expect any high-speed action or anything like that. Still, WiFi FPV is great for taking aerial videos and photos, allowing you to get the perfect angle from far away. Since it can reach high altitudes (keep in kind you are not allowed to surpass 400 feet if you live in USA), MJX Bugs 2W can record exceptional city landscapes with ease, thanks to its brilliant FHD built-in camera. We are going to keep our focus on brand new affordable drones since Altair AA108 is even newer than MJX Bugs 2W. 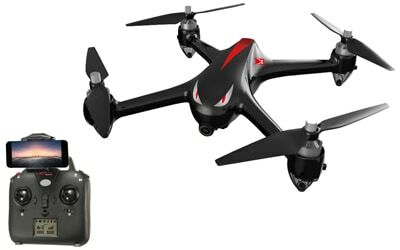 Due to the fact it left a great impression on our staff, Altair AA108 definitely deserves to be in this list of best cheap drones with camera. With a gorgeous design, impressive flight stability and above all – awesome specifications, I am sure many of you will agree that there is not much separating the first 2 drones on this list. I would first like to mention its awesome built-in HD camera. Don’t mistake it for FHD like the one on MJX Bugs 2W… but don’t underestimate it either. 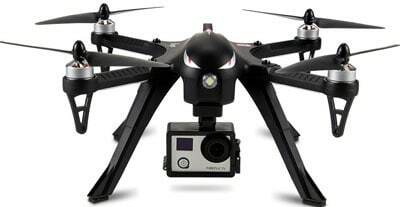 This camera is capable of producing decent quality aerial footage whenever you desire. Moving forward to the design, you will notice relatively thick prop guards protecting the small 2 bladed propellers from impacts. But, they can’t stop your motors from destroying if you keep pushing that throttle after your drone has landed in grass. Keep that in mind if you don’t want to buy brand new motors right away. In terms of features, this birdie incorporates headless mode alongside 3 speed settings for beginners, intermediate and advanced users. But, that’s not all – Altair AA108 also sports altitude hold which will allow your drone to hover at a constant height for a short period of time, just enough for you to take that perfect aerial selfie… or dronie, how people like calling it these days. Specifications are solid too. Range is probably going to disappoint some of you since it works flawlessly for up to only 100 meters. Airtime, on the other hand, fairs much better with approximately 10 minutes of fun time. 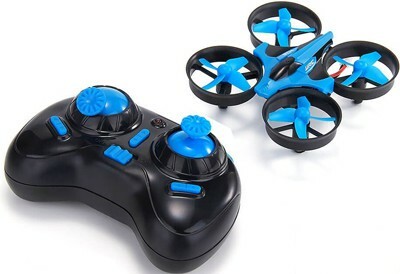 UDI is a well-known toy-drone brand with a plethora of models available for purchase. Today, we are going to be focusing on one of their most popular ones – U818A HD+. It incorporates an interesting design and, believe it or not, has great specifications that would put to shame some higher priced drones out there. While some might find it too bulky and heavy, in reality U818A doesn’t weight that much more than its competitors… but provides an extra dose of durability due to thick and sturdy prop guards. Besides that, let’s see what else can this baby do! Kicking off with the features, you will be happy to know UDI U818A HD+ sports one key 360 rolls as well as headless mode and low battery alarm… and that’s it as far as software features are concerned. In addition to them, UDI U818A HD+ also features a package of extra accessories including an extra battery as well as a power bank that will allow you lots of flying time with this birdie. So, with the addition of charging on-the-fly, I suppose UDI U818A HD+ is an inevitable summer hit. The HD+ version of UDI U818A comes with an upgraded camera which can now record aerial videos in 720p resolution. It doesn’t draw too much power from the included 1S LiPo battery so you don’t have to worry about it drastically shortening your airtime. Last but not least, the specifications of UDI U818A HD+ are not bad considering that low price tag to its name. As far as range goes, you will be getting up to 30 meters of signal. Battery duration goes around the 10–minute mark, although you will probably end up with cca 9 minutes if you plan on recording with that integrated camera. Bugs 3 is, by far, the most popular drone made by MJX. However, that could all change with the introduction of the all new Bugs 2W which brings forward a dedicated camera too. But still, despite the obvious lack of camera, can Bugs 3 prove viable even after its “upgrade” is released? Well, the ability to house GoPros and other high-quality action cameras could in fact sway the odds in Bugs 3’s favor. That’s why we are going to take a closer look at it and see what’s it all about! First things first, it needs to be said that MJX Bugs 3 is among the cheapest brushless quadcopters out there. With a bulky body, sturdy frame and bright LEDs, it’s insanely fun to fly around with. However, the pure fun starts when you mount a GoPro on this beauty since it comes with a dedicated mounting bracket. True, there is no motorized gimbal or anything else that would effectively deal with shakiness, but the drone is stable enough on its own so I doubt vibrations will be a big problem in your aerial footage. Specifications aren’t half bad either. As a matter of fact, with 18 minutes of flight time and such an aggressive price tag, it becomes clear that MJX Bugs 3 offers great bang for your bucks. Range goes up to 300 meters although some users are reporting even slightly more than that. Then again, that kind of thing heavily depends on the flying area so we cannot be the judges of that. To summarize, if you already own a GoPro and you would like a cheap but sophisticated Altitude Hold drone to mount it onto, you cannot go wrong with MJX Bugs 3! Instead of the standard brushed motor mechanisms, LaTrax Alias incorporates 11T pinions on its motors whose rotations are transformed to motor shafts carrying props. This mechanism greatly improves power efficiency and allows LaTrax Alias to fly around for up to 10-12 minutes, depending on how fast you’re pushing it. When the range is concerned, I doubt you will be able to go past 100 or even 150 meters without losing the line of sight. However, this could be avoided by installing an AIO FPV system and enjoying fast paced FPV with this speedy little devil. In terms of features, LaTrax Alias can do all sorts of acrobatics. Flips, rolls, funnels, all that good stuff will be one button press away. IN addition to that, LaTrax Alias also features bright LEDs and gorgeous canopy that comes in several different colors. The controller resembvles console-styled ones and doesn’t breathe with too much quality at the first glance. But, once you get a hold of it, you will realize how precise and intuitive it is. With the exclusive SAFE technology that adds stability and agility modes, Blade Nano might be the best cheap drone choice for beginners to test their skills in the micro racing quads territory. With a lightweight frame, decent punch and RTF package, I really doubt there are many better old school micro quads. However, let’s not judge too quickly as it’s only fair to first give a proper look into the drone itself before jumping to any conclusions. First things first, I believe it’s obvious Blade Nano doesn’t have an FPV camera. Despite that, it is still insanely fun to fly due to its ridiculous size and great maneuverability. Both indoors and outdoors will work for this beauty, unless there are particularly strong winds that can keep it grounded. Moving on to design, Blade Nano sports a sketchy and aggressive canopy and optional prop guards that protect its 2 bladed props from crash damage. Operating range goes for about 30 to 50 meters and the stock batteries last for around 5 to 7 minutes. But if you ever get sick and tired of LoS flying, you can always place an Eachine TX01 on this birdie and transform it into a tiny whoop with higher C rating batteries! This will make it even more fun to fly and give you a great FPV experience if you opt to mod it. All things considered, the RTF package of Blade Nano delivers an awesome flying experience for beginners and more experienced users alike. The former will have a cheap and stable practice platform and the latter will get a drone with plenty of upgrading possibilities. At the moment, the best cheap racing drone that comes in a Ready To Fly package is Walkera Rodeo 110. Even though there are numerous other similarly sized quadcopters, I firmly believe this is the crème de la crème of micro FPV racing quads. Want to know why? Continue reading then! First things first, you need to know there are several versions of Walkera Rodeo 110 available on Amazon. Don’t mess their suffixes up or you will end up with just the drone without the controller. While that is good for more experienced users, if you don’t already own a compatible transmitter, you will have to spend more money to get one. A lot more money, mind you. When it comes to this particular drone, there’s an RTF version with Devo 7 controller which works like a charm. However, you can still hook up your own receiver (there’s a slot on the bottom side of its body alongside the PPM/SBUS switch) and use your own transmitter if you decide to go for BNF. In terms of performance, Walkera Rodeo 110 does not fail to deliver. Starting off with its battery, this birdie is powered by a 2S 850mAh LiPo that can hold it up in the air for up to 6 minutes per charge. Powered by the widespread F3 flight controller and running brushless WK-WS-13-002A motors, there is no doubt Walkera Rodeo 110 is fast. Plus, it bundles together a solid 600TVL camera that can switch between PAL and NTSC formats. All in all, Walkera Rodeo 110 is an excellent solution for people trying to get into FPV racing… Not people trying to get into drones… but people who already learned how to fly toy-grade drones and want something much faster. Perhaps not the most popular model out there, Makerfire Armor 90 is still a great drone, well deserving of being listed among the best cheap racing drones. Its appearance and size is very similar to that of Eachine E010C, sporting the same styled design with integrated prop guards. However, this is a BNF model unlike the other 2 on this list. What this means is that you will only get the drone itself with all necessary parts with optional receivers. As a matter of fact, you can even get it in an ARF package. However, if you chose BNF, you will have to go for either Spektrum DSMX/DSM2 or FrSky XM+ receivers, depending on which transmitter you own or aim to purchase. As far as the weight is concerned, this birdie weighs in at 85.3 grams together with its insanely powerful 2S 350mAh battery that has 60C rating. Crazy, huh? Combine that with miniature MKF1104 7500Kv motors and 10A 4 in 1 ESC board and you’ll realize just how powerful this thing is! Propellers are 3 bladed, but I suppose mounting 4 bladed ones with the same size factor (1935 are the ones you want) would squeeze in a bit better liftoff force. The camera in question is a 600TVL 40CH 25mW wide angle with whip antenna swinging at the top. Lastly, this birdie is BetaFlight compatible as it runs on F3 flight controller with OSD…. So, all things considered, Makerfire Armor 90 is bound to deliver exceptional performance both for indoor and outdoor FPV runs. As you can see, all 3 of these racing drones are miniature. Well, even though Walkera Rodeo 110 is the biggest one out of the bunch, it is still considered as a fairly small racing quad. On the other hand, here we have the smallest one out of the bunch – the FPV version of the popular Eachine E010. With a C at the end of its name indicating it has a micro camera, could this little birdie prove to be the ultimate micro FPV quad on the market? Well, as far as its performance is concerned, I don’t see a reason why you should steer away from it. It’s extremely lightweight and small, allowing for a great indoor experience with the addition of 25mW 40 channel CMOS camera. It’s an 800TVL model that works with virtually all 5.8G displays or FPV goggles. The flight time and range are nothing extraordinary which is justifiable consider we are talking about an indoor-only drone. Still, the 1S 150mAh battery has 45C rating which provides quite the punch when you need it the most. Unfortunately, the biggest downside of Eachine E010C is the default controller that comes with the standard package. You see, there are no changes from the original one which comes with Eachine E010. However, if you own a Devo 7 transmitter, there are configuration files available on the internet that will allow you to control your cheap tiny whoop with a professional quality transmitter. With that being said, Eachine E010C can go from a toy-grade mishap to a proper tiny bird in a matter of minutes. It’s so often that you see comparisons between brushed and brushless drones. While these comparisons are usually on point, many of them don’t explain the basics of the topic. Come to think of it, I doubt many beginners even know what parts of a drone can be brushed or brushless in the first place. To shed some light on the topic – we are talking about motors! Brushed motors use a rotating set of coils known as an armature which acts like an electromagnet. They are cheap to manufacturer and readily available from a wide variety of online marketplaces. However, they are not nearly as durable as their brushless counterparts and can easily die when you apply torque while they’re stuck against an obstacle. Brushless motors use a permanently magnetic external rotor and 3 phases of coils. They have a much better lifespan than brushed motors since there are no brushes that can wear out. You might occasionally need to lubricate the bearings but that’s about it as far as maintenance is concerned. So, in the long run, I believe it is pretty clear that brushless motors are a better option. Not only do they have much better lifespans but they also provide better power output vs weight ratio… and that’s of crucial importance, especially for miniature FPV drones. Talking about FPV, let’s take a moment and further discuss that topic as well! FPV stands for First Person View. It’s a broad term but, as far as drones are concerned, it represents a specialized feature that’s common with other types of RC devices as well. This feature is basically in charge of providing you with a video livestream straight from your drone’s camera. However, there are 2 main versions of FPV currently available on the market. Don’t worry, we will go through both of them right away! WiFi FPV is a widespread feature that is implemented across a huge number of drones. From cheap selfie drones to sophisticated aerial photography platform – WiFI FPV is included everywhere. However, when it comes to those cheap selfie drones (I’m not referring to the likes of DJI Spark of Yuneec Breeze here, I’m talking about those $50 toys), the usual problems with WiFi FPV is short range (up to 100 meters in best scenarios) and huge latency. This renders any kind of high-speed FPV maneuvering impossible. But that’s where 5.8G FPV kicks in. You see, 5.8G connection is much more reliable and works on a much larger range than its WiFi counterpart. It’s a bit more expensive to manufacturer but is well worth it. If not because of the extra range then surely because of virtually no input lag. That’s what matters the most as far as racing drones are concerned. In fact, all FPV racing is done with 5.8G FPV since WiFi simply cannot be used for this purpose. Acro mode does not involve gyro stabilisation module. This allows your drone to do amazing flips and rolls as well as provide with impressive maneuverability at narrow turns. However, keep in mind that acro flying requires a lot of effort and training until you get your brain muscles to remember the basic flying mechanics. Stabilised drones use the integrated gyroscope to effectively stabilize drone’s flight at all times. With that said, your drone will only be able to pitch and roll to a certain degree to prevent the drone from flipping over. It’s my first drone, do I need a camera? Well, this heavily depends on what sort of action you want from your first drone. If you just want a cheap toy that can fly around for a few minutes then I suppose you don’t need a camera. However, if you are interested in aerial photography or… perhaps you’d like to try out FPV flying, then drones with cameras are the way to go! Still, not all cameras are the same. Besides resolutions, there are also 2 different types of sensors used in drones – CMOS and CCD. Let’s take a closer look at them! Stands for Charge Coupled Device. These sensors are fairly expensive to manufacture and consume slightly more power than their CMOS counterparts. 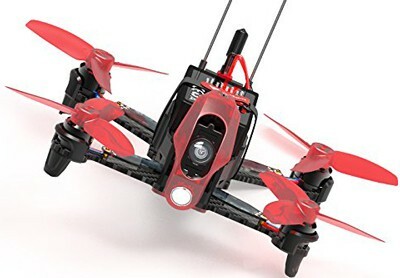 However, they’re better at low light environments and possess a huge advantage in terms of rolling shutter wobble, which is why they’re used by professional FPV racers. Stands for Complementary Metal Oxide Semiconductor. These sensors integrate miniature amplifiers in each of their pixels which are in charge of doing extra work as soon as imaging data arrives to their location. Thus, CMOS sensors are slightly more power efficient and much cheaper to manufacture. When you first takeoff in the air with your drone, there’s no room for panic. If you end up panicking as soon as you think you lost control over its movement, you can expect an immediate crash. That’s why, to prevent this from happening you will need to calm down before each flight. And remember, if you crash your drone, make sure you put the throttle to 0 to prevent destroying your motors. The most frequent mistake beginners tend to do is lift the throttle stick too high up at the takeoff. This is unnecessary since drone controllers are extremely sensitive and react even to the slightest of touches. That’s even more true in terms of racing drones which have massive acceleration that would, if throttle is lifted all the way to the top, result in sky-high falls in a matter of seconds. Before you try doing flips, tricks and anything like that, I first suggest you practice linear paths with your brand-new drone. As a matter of fact, perhaps trying out an FPV racing simulator like FPV Air Tracks would be a good idea too. It will give you a safe environment to learn the basics of flying without endangering your drone or people around you. Drone crashes are an inevitable part of this hobby. Even the most experienced users crash their drones every now and then. Still, there’s no need to dramatize over the situation. Simply order the broken parts (if any of them broke, of course) and wait for them to arrive. The repair will take just a couple of minutes, in most cases… and you’ll be right back in the air! Such innovation and demand has pushed new companies to enter the business with new and inexpensive drones, able to everyone purchase. Every person can own a drone, from toy/hobby to more professional UAVs, the market sees new products every day. If you are new to this machines and you never flew one, maybe you want to start by practicing with an affordable drone. Take some time, browse our lists and find out what’s the best drone you can buy. Nowadays even the toy grade drones already are powerful interesting machines, check our list of top drones to buy to find the beginner drone you would like to start with. As everything in the market, the higher the price, the most recent technology it has. You will be surprised how fast the technology has advanced in the last years. 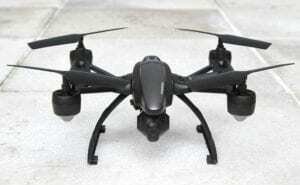 A cheap drone can come with its own HD camera and FPV system (real time video transmission). Some even have integrated GPS to assist you in flight and provide you great features. 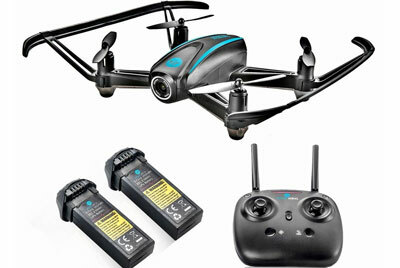 Check our Top 10 Drones Under $200 article for cheap drones already with FPV cameras. It also allows for one of the most useful feature drones currently have, autopilot function. Yes, this is the 21th century and you can now own an unmanned vehicle able to fly itself. Program the path through software on your smartphone, tablet or PC. The drone will than fly to each waypoint you have selected while recording or photographing. Some of the most affordable drones with such features are on our Top 10 Drones Under $300 article. So, which drone should you buy? Well, it depends on your experience and budget, of course. If you’re beginner looking for your first drone, you should go for some model that costs under $300. I’m pretty sure you’ll crash it, that’s totally normal when you’re learning how to fly.. and that’s okay. For that reason, I wouldn’t suggest buying some expensive ($500+) drone as your first drone. It shouldn’t take too much time to learn how to fly it. In my case, it took me about 5,6 days. So, be patient, buy some cheaper model, learn how to fly and soon you’ll be able to go for something more advanced. This is one of the most popular drones in this price range. If you ask random guy on a street to name two drones he’s heard about, he’ll probably say DJI Phantom and Syma X5c 🙂 Syma is well known for their toy grade drones, I believe it’s most recognizable brand in this price range. X5C is great starter drone, it has everything your first drone should have. It’s made of some elastic plastic so you shouldn’t worry too much if you crash it here and there. Mine one has survived many of them. Flight time is around 6 minutes, and control range is somewhere between 50 and 100 meters. As usually, I would suggest buying extra batteries. One more thing I almost forgot, SYMA X5C has camera. What else could you expect in this price range? 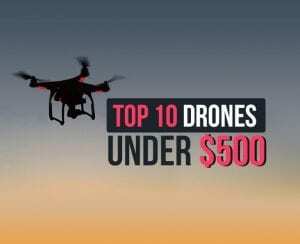 View Top 10 drones for less than $50. JXD is still relatively unknown drone manufacturer, but I believe they will become very popular among drone hobbyists. Reason for that is obvious, they deliver good value for the money. We have tested almost all their models in 2016, and we’re very happy with what we’ve seen. JXD 509W is WiFi version of previously launched JXD 509G. Difference is, on 509W you have to use your smartphone as a screen, while 509G comes with it’s own screen. Again, this drone is made of some elastic plastic and it should survive most of your crashes. Propellers are very elastic so they shouldn’t break either. 509W has many cool features previously unseen in this price range, such a : Altitude Holder, One-Key Home Return, Headless Mode, Automatic Landing. 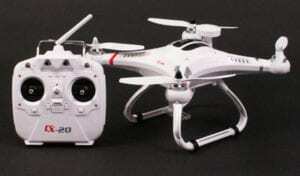 Camera is 0.3MP, battery should provide you with 6 minutes of flight time within range of 50-70 meters. 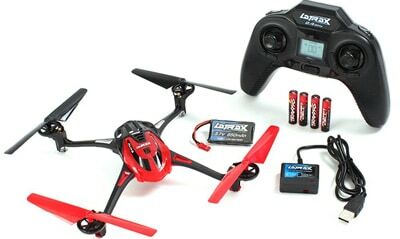 One of the coolest looking, and at the same time top cheap quadcopter. It comes in 3 different styles : Snow, Jungle and Sand. It doesn’t have it’s own controller, which means you’ll have to use your smartphone (android or iOS) to control it. It comes with built in 720p camera, which is more than good for this price. It has really good sensors which means it’s good and stable flyer. This is very important for drone which is controlled by use of smartphone. Flight time is around 10 minutes and range is up to 100 meters. Cheerson CX-20 Auto Pathfinder is one of the most bought quadcopters under 300 dollars currently in the market. The customer is not wrong, indeed it is a powerful machine at a great price. Mainly due to its capability to carry a Go Pro camera and some great features. Features such as IOC (Intelligent Orientation Control) the CX-20 uses the GPS to remember its coordinates and recover from spins. It has fixed position, hovering steadily to record video. When the battery gets low it automatically land itself to avoid crashes. Return to home function with the push of a button, so you don’t lose it. Its 2700mah 20C 3c battery gives him enough power to fly 10 meters per second for as long as 15 minutes flight time. One of the most common uses for drones nowadays is aerial recording, we will always seek to find the best products out there in the market at the best prices. Many of the drones in our top articles are able to carry the famous Go Pro camera, others have their own alternatives. Either way we ensure always ensure the best quality within the price range. Perhaps you are into acrobatic or racing drones, well we have those on our lists to. Fast drones with powerful brushless motors ready to amaze anyone who sees them taking on the sky. 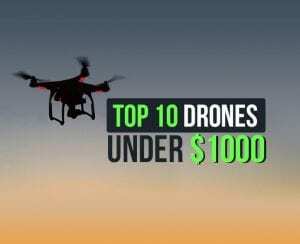 For the best of the best, the top notch products with the most recent technology and best specifications check our Top 10 Drones Under $500, you will be surprised at how advanced hardware and firmware is. Don’t forget, keep visiting us daily for more lists and products. We promise to keep you updated and well informed on the best drones. Above everything, we are here to help you choose which one fits you best!